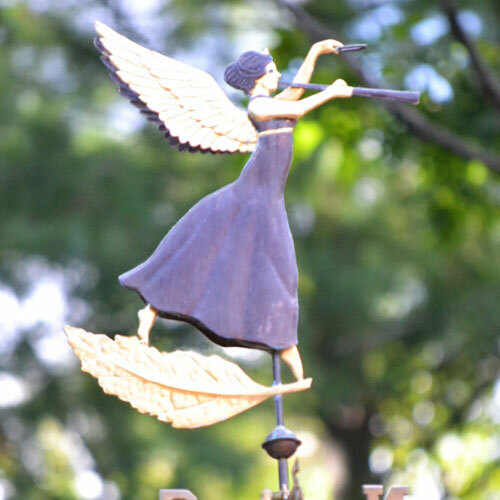 When a weathervane is placed outdoors, the copper and brass of the sculpture piece will immediately start to patina and should eventually turn lovely and distinct shades of green. 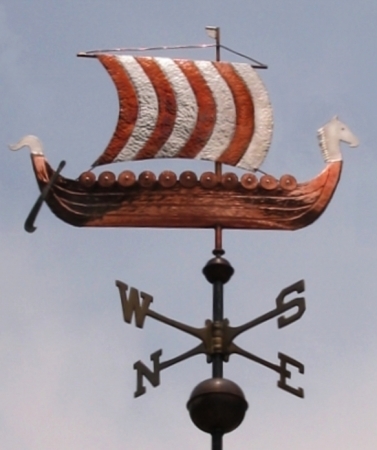 The rate at which the weathervane turns color depends on where you live. If you are right by the ocean, your weathervane will start to pick up the green color much sooner than if you live in an arid location such as Nevada or Arizona. 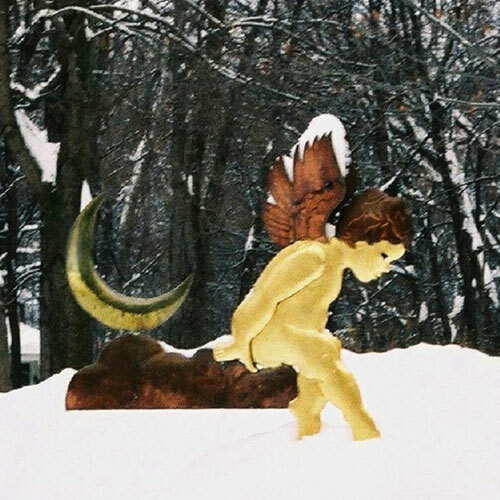 Adding optional gold or palladium leaf to a weathervane creates visual interest as the sculpture piece moves through the patina process. 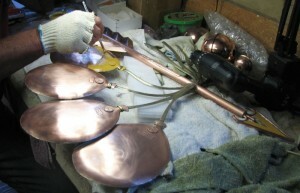 When the copper and brass are in their brown stages (see our description of copper above), the warm yellow gold leaf or silvery/blue palladium leaf creates a dramatic contrast, especially when your weathervane is silhouetted against a competitive background such as trees, a hillside or another structure. The consensus is that gold or palladium leaf have a track record of standing up to environmental conditions such as UV radiation, intense heat, wind, rain and snow over an extended period of time. There are copper weathervanes today that were made in the Victorian Age that still have traces of their original gold on them, even after over a century of exposure. Even so, leafing durability is also contingent on location. Leafing applied to weathervanes located right on the coast will wear out more quickly than leafing on weathervanes located in less extreme environments. Depending on the installation site, gold and/or palladium leafing can typically last anywhere from 5 years (near the coast) to 60 or 70 years in protected environments. 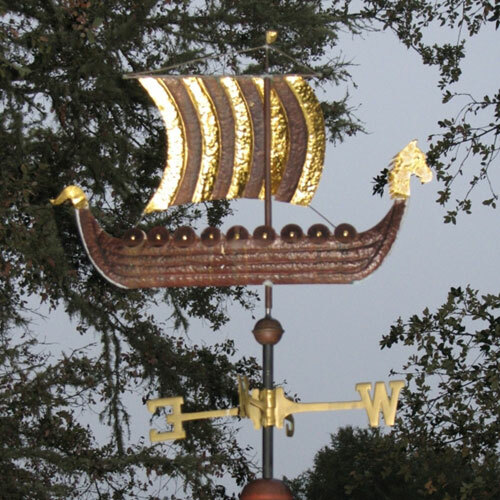 Here is a side by side example of palladium and gold leaf used on two of our Viking Ship Weathervanes. 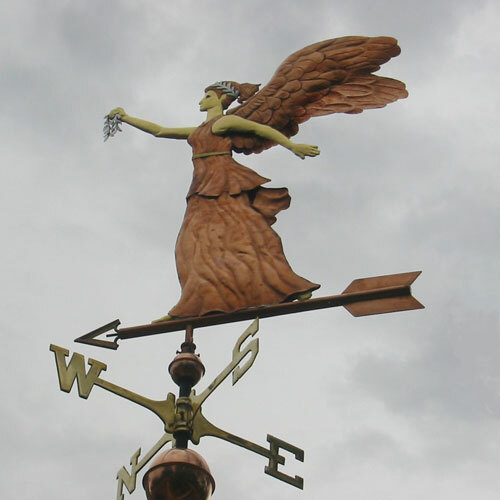 The price to add gold or palladium leaf to a weather vane depends on how much of the vane’s surface is leafed. 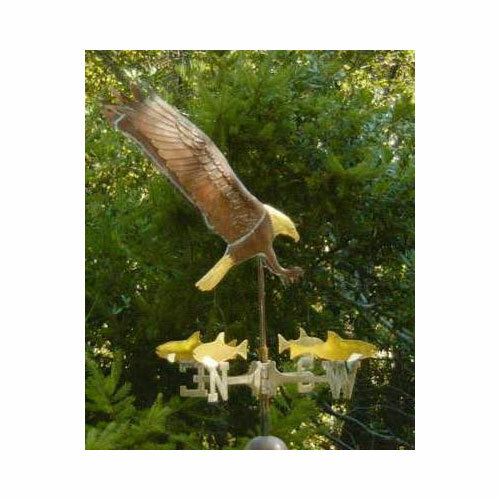 The cost can be quite low to gold leaf a dog’s collar on one of our small size weathervanes (one-foot sculpture piece) or significantly more to gild an extra-large size (four-foot sculpture piece) Yellow Labrador Retriever’s entire body. 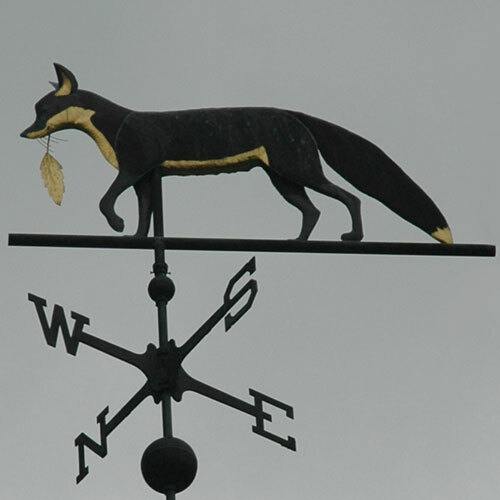 If you are interested, we can provide you with a quote to gild any or all of the weather vane you are considering. 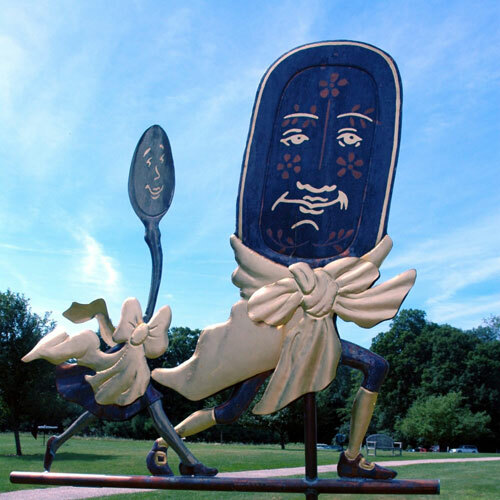 When the copper has weathered to the green shades for which aged copper is renowned, residual gold leaf creates a striking juxtaposition that is highly prized for its beauty by weathervane collectors. Gold leaf is gold that has been hammered into extremely thin sheets by goldbeating. Because gold leaf is resistant to corrosion, it has been used for hundreds, if not thousands of years, to enhance exterior architectural elements and sculpture pieces. 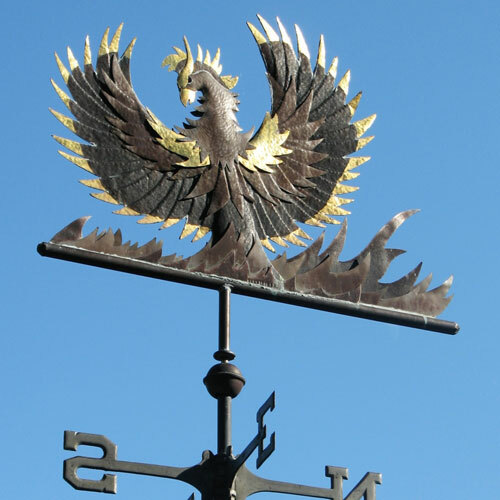 Gold leaf is the longest lasting coating which can be applied to a weathervane. Some 50 -100 year old weathervanes still have traces of their original gold leaf. 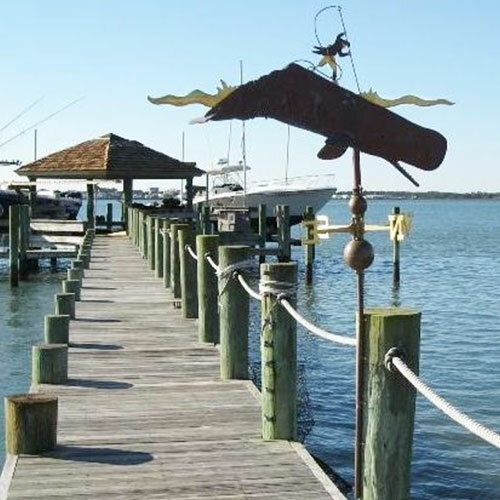 In environmentally active areas, such as marine environments, the gilding may have to be reapplied more frequently than if the weathervane is in a more tranquil environment. Gold leaf is available in a wide variety of karats. Here at West Coast Weather Vanes we use the highest quality, European crafted leaf in either 23 or 23.5 karat (depending again on the environment in which it will reside). Only genuine gold leaf is recommended for exterior gilt surface. Anything less pure may provide inadequate results, compromising its durability and longevity. 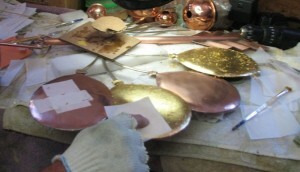 Layering gold leaf over a surface is called leafing or gilding. In the case of metal gilding, the surface to be gilded is first thoroughly cleaned, then a metal primer designed for this purpose is applied to the surface. Once it has dried, a special kind of adhesive known as Size is then applied to the surface. After that, we wait for the ‘tack’ to set up. Proper tack for gilding is the point when the Size is no longer wet, but not fully dry, hence it is ‘tacky’ or just slightly sticky. The amount of time it takes for the Size to set up varies depending on the weather conditions here at our studio. 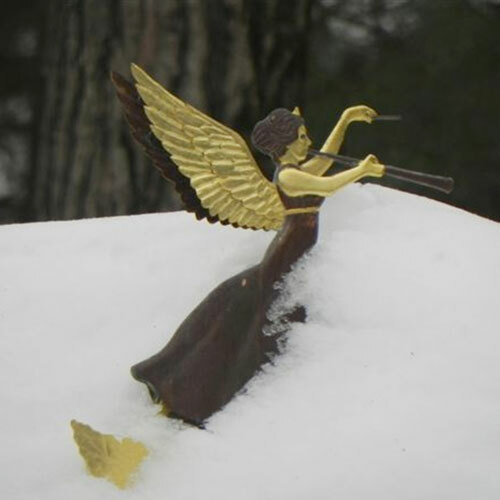 On a cool, foggy morning or on a cold rainy winter day, it will take longer to set up than on a warm sunny afternoon. The size must be monitored continuously by an experienced artisan to catch the proper moment at which to apply the gold leaf. When the tack is finally ready, the gold (in the form of a square 3-3/8” x 3-3/8” sheet) is carefully hand pressed onto the varnish. After the Size with applied gold leaf is completely dry, it is carefully burnished to bring out its luster. If we are adding both gold and palladium leaf to a weathervane, this process is done in two stages, each following the same procedure outlined here.